The darling buds of May! Say farewell to frosty nights and hello to longer days, warmer nights and beautiful blossoms! We think flowers should be your focus this month, so that sitting outside has the optimum effect for you. 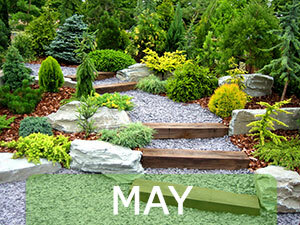 Follow these tips to a majestic May garden. – BE CAUTIOUS: Yes, the days are heating up and the sun is shining, but the nights can still chill off. Leave your half-hardy plants out during the day, but put them back undercover 7-10 days prior to planting. – INSPECTION: Be sure to regularly check your pots and plants for pests and diseases. If this is undertaken properly, you will reduce the risk of having to replace them or get rid of an entire infestation. – DE-WEED: Be sure to keep an eye on unwanted plants popping up in your flowerbeds and pots. They can suffocate water and nutrients from meeting the plants you want in your garden.